We all know the o so useful but boring Duck Tape. The grey tape is famous and used for all kind of quick repairs. But now is the time to replace the boring grey to something way more fun. 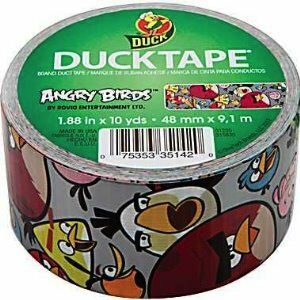 How about Angry Birds Duck Tape. This roll of Duck Tape is 1.88 inch wide and 10 yards long and is covered with the famous birds. Of course there is Red Bird and all of his friends all having a fun time on the tape. So now you can decorate and repair anything with this Angry Birds Duck Tape.